Coat a skillet with a very thin layer of olive oil and add the onions. Once the onions are cristalized, brown the ground beef, add pepper and oregano. Add the olives, diced and the tomato, diced. Let it cook in medium heat until done. Fry the plantains cut un in long slices. Put aside . Steam the string beans. Put aside. 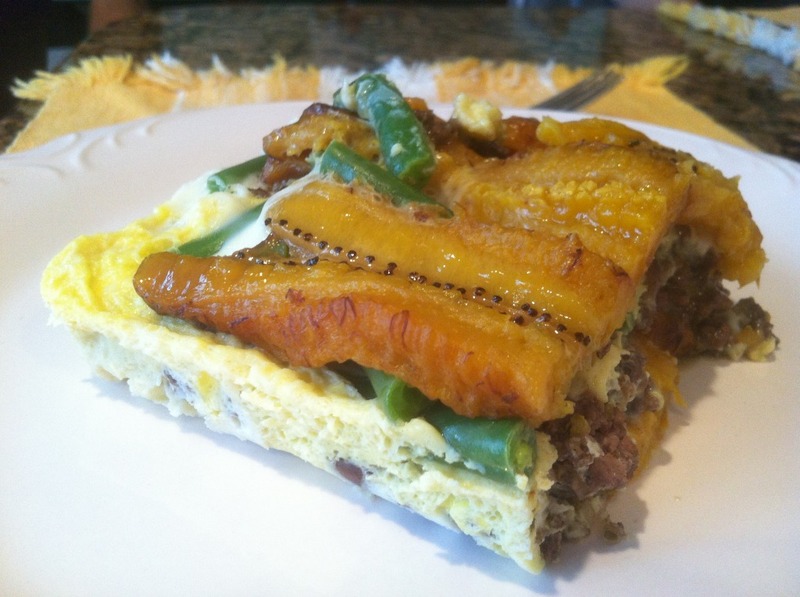 In a square baking pyrex, place a layer of the fried plantains, then a layer of the ground beef, a layer of string beans and cover all with another layer of fried plantains. Beat the eggs and pour them over the layer of plantaind, ground beef and string beans in the pyrex. Place in the preheated oven at 350 degrees farenheit. Cook for half an hour, or until the egg mix is well cooked. Serve by itself or with a salad. NOTE: Instead of frying the plantains you can bake them.